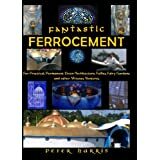 If you have ever wanted to sculpt or build in a permanent material that is extremely strong and can be moulded to any shape, ferrocement is the medium for you – and this concise book shows you how. Tools, techniques and sample projects – a garden pot, angel, dome, and more – are all logically described and illustrated. The many photos showing the building of Cafe Eutopia will inspire and inform. PaperbackOrder in the next 42 hours to get it by Wednesday, May 30.